A fairer balance of gaming products on the high street is gaining traction within Westminster. 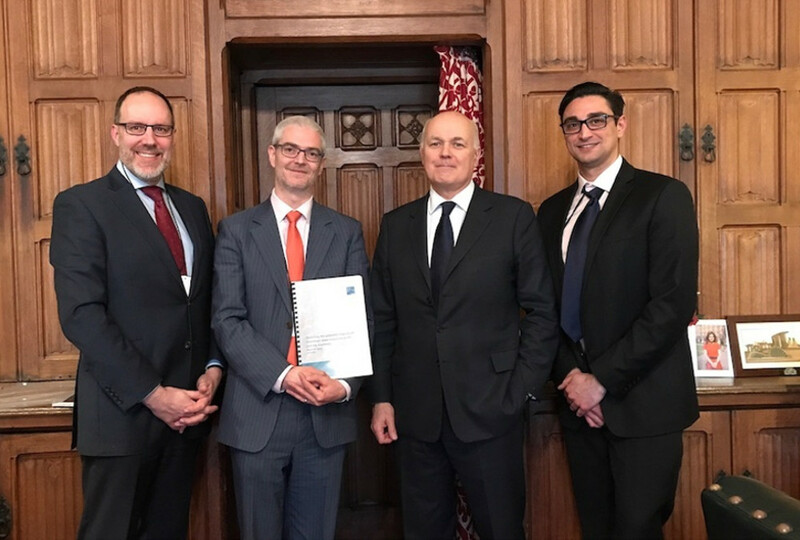 A Bacta delegation last week met with former Tory leader Iain Duncan Smith to seek support for its £2 stake limit for FOBTs. The trade body did not leave Parliament disappointed. A senior Bacta delegation comprising national president Gabi Stergides and chief executive John White, supported by Oliver Hogan, head economist at the influential Centre for Economics and Business Research (CEBR), met with former leader of the Conservative Party, Iain Duncan Smith, last week to present the findings of CEBR analysis on the economic impact on bookmakers of a reduction in FOBT stakes to £2. The meeting, which was held at Duncan Smith’s offices in the Palace of Westminster, explained Bacta’s key arguments that the impact of reducing the FOBT stake to £2 could be up to 47 percent lower than suggested by the government’s initial impact assessment and could also be offset by the reduction in the fiscal costs of addressing the significant social problems caused by FOBTs.